Designing a KITCHEN is a very demanding task. Regardless of its style, whether it is a noble oak kitchen, a modern and elegant industrial kitchen, or a minimalist Scandinavian kitchen, it needs to be first and foremost functional. A traditional kitchen is a true heart of a house – and as it is the most frequently used room it is exposed to increased wear as well as moisture and heat. Therefore, at our Studio we consider smart design and the quality of manufacturing a question of paramount importance. HOW TO CHOOSE A SUITABLE KITCHEN? How often do you cook? – to define kitchen ergonomics. How big is our kitchen? Is it a separate room or is it connected with a dining/living room? – to define kitchen’s function. The good practice of contemporary kitchen design requires distinguishing 5 functional areas, each with its proper equipment and different spatial requirements: i.e. stock, storage, washing, preparation, and cooking. Also, regardless of the shape and size of the room and the kitchen furniture, the order of these areas should be kept as listed above. Since most of the work in the kitchen is carried out while standing, the height of the kitchen cabinets must be adjusted to its most frequent users. According to the experts, when designing a fitted kitchen, the worktop should be located approximately 10 to 15 cm below the height of this persons elbows. Of course, there is a margin for adjustments of a few centimetres, if there is more than one frequent user. Another crucial aspect is the space between the worktop and the hanging cabinets: the distance should not be less than 45 cm, in order to assure comfortable usage. Last but not least, an optimum depth for the hanging cabinets is 28 to 30 centimetres. If the kitchen is spacious, i.e. has 15 m2 or more, and is a separate room, it is perfect to use as an everyday dining room. The optimum solution for such arrangement is to put the kitchen furniture in an L-shaped or U-shaped pattern along the walls, while the table is placed by the wall, which has no cupboards. Another option is to create an island or a peninsula. If the size of the room designated for the kitchen is too small to allow that, it is recommendable to merge it with living or dining room. The kitchen and living spaces can then be visually separated using a low wall, on top of which a worktop can be placed, thus converting it into a table for daily meals. Another manner of separating the kitchen, less definite, is to locate an island or a small bar there. There are several approaches to how the kitchen fronts may look like, and they strongly depend on house dwellers preferences. A rustic kitchen will, naturally, have solid wooden kitchen furniture. The choice of timber in case of fitted kitchen furniture is practically unlimited, while and different types of wood offer different shades and colours. For instance, a village kitchen may feature pine wood elements, while an oak kitchen is an interesting solution for those who seek to add a touch of of nobility. Also, in a wooden kitchen a stone worktop - or any other natural or ecological materials for that matter – harmonise exceptionally well. Dubinski Joinery has wide expertise in manufacturing solid kitchen furniture. Throughout the years of delivering bespoke kitchens to our clients, we have elaborated our own method of gluing layered wood – only a handful of Joineries use similar methods. This process makes our wooden kitchen furniture highly resistant to deformations and mechanical damage. Our technology allows us to offer our clients long-lasting products, granting that their custom made kitchens will be a safe and reliable environment. The assembly of wooden kitchen furniture is crucial for their durability. At our Studio, all the elements that will form a future wooden kitchen, i.e. all the mouldings, panels and ornaments, are painted separately before being put together. This guarantees that even after many years of service, all elements will look as if they were brand new. STONE WORKTOPS Granite, marble or travertine complement oak kitchens in a marvellous way. Although associated mainly with luxury kitchen furniture, they are worth considering also in more common designs. Similarly as the oak, if impregnated properly, these stones combine remarkable resistance to stress with elegance and nobility. Even though they may not be the most affordable of materials, they are well worth their price, offering unmatched resistance to heat, cracking, scratching, and other mechanical damage. What is more, they are extremely easy to maintain. WOODEN WORKTOPS Wooden kitchen worktops are a marvellous choice, but also imply an obligation. On one hand their natural look perfectly harmonises with wooden fitted kitchens as they add warmth and cosiness to any traditional kitchen design. On the other hand, they require special treatment. Coating with a lacquer or a melamine grants them resistance to staining, while impregnating regularly with oil, gives great water resistance. However, they are not resistant to temperatures exceeding 100 °C, and when not protected they may be easily damaged. The aspects discussed above include just the basic matters. While designing a wooden kitchen for our clients, we take care of every detail: from selecting hinges and fittings to suggesting specific appliances and equipment that matches the kitchen furniture. Our comprehensive approach, far exceeding what is necessary to simply constructing wooden kitchen furniture, has a single, well-defined goal: the satisfaction of our clients. And we meet that objective by offering our clients wooden kitchens that combine eye-catching and impeccable visual design, unparalleled functionality and decades of reliability. 15. Extremely rich, stylish kitchen furniture. In this implementation, it is worth paying attention to the protruding cabinets so much in fashion these days, while the door and drawers enter inside the frames. Such design adds an elegant style to the kitchen furniture. 16. Portals and heads carved in oak wood in a suburban residence fitted kitchen in oak. 4. Creamy kitchen furniture made of wood. Hosts requested the smooth surface of furniture, so it was made of alder wood. Cuts in cabinet bands and an appropriate selection handles are decorations per se. 5. A cornice surrounding the stove is the only heavily carved element in this wooden kitchen. 6. Provencal style kitchen cabinets. A blue afterglow of the primer shines through the whiteness of the surface. This is the effect of the surface being gently wiped off. We have also selected stylistically matching handles, painted with blue flowers. 7. Custom made table and chairs for a Provencal style traditional kitchen. 8. Cabinet for small items, trinkets combined with a wine shelf. 11. Massive and impressive fitted kitchen in the English style. Chocolate stone worktop on top of all. 13. The surface of this fitted kitchen furniture impresses both in terms of concept and quality. The kitchen is exclusively made of oak. 14. This Provencal kitchen furniture was designed and manufactured with the utmost care and attention to every possible detail. 15. 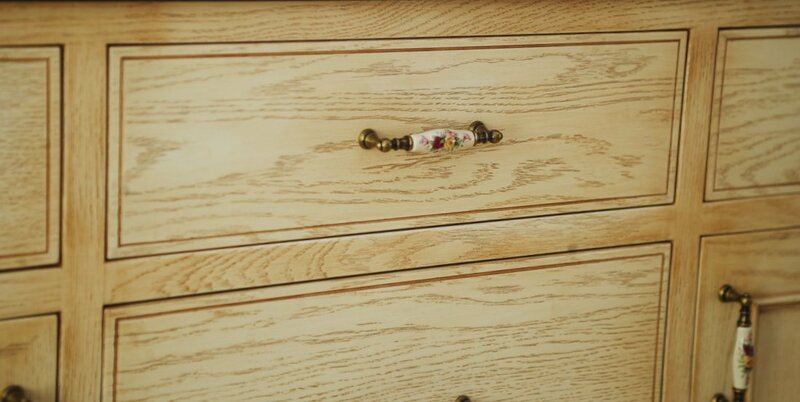 The translucent paint on the surface of this oak kitchen furniture reveals a unique pattern of the grain of wood. Dimming and wiping of each corner of the cabinet creates an additional effect. 16. Oak wood is ideal for when we want to emphasize the harmony with nature. In the case of this Provencal oak kitchen, grainwood was emphasised with colour, and then brushed and coated with varnish. The elements complementing the character of this farmhouse kitchen are flower-painted handles.